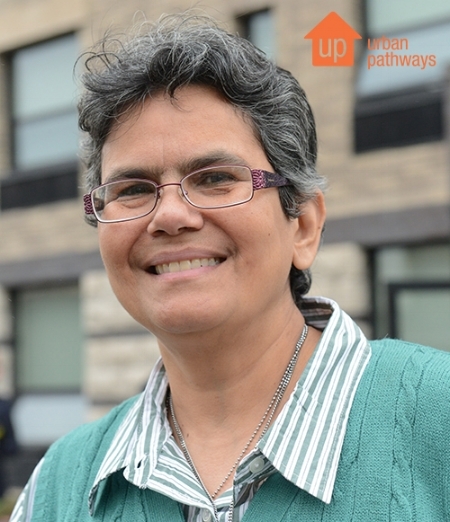 Since 2014 Gloria Montes, a veteran of the United States Air Force, has called a studio apartment at Urban Pathways’ Clinton Avenue Residence home. Gloria served in the United States Air Force as Sergeant for the Military Police for six years. Stationed in various bases around the world, Gloria was also the first female Military Police Sergeant in Turkey. She is very grateful for her time in the armed forces serving our nation; being a solider gave her valuable experiences and some of the best times of her life; it was also what started her alcohol abuse. Gloria never drank before joining the Air Force; she recalls starting to drink to cope with the stress of basic training as well as being away from her family for the first time in her life. As she was deployed overseas the drinking got worse. Being the first female MP in a traditional country opened Gloria up to mental and physical abuse which led to more drinking and her first hospitalization for alcoholism. After being honorably discharged Gloria worked in security management for the next 22 years all while struggling with alcoholism. She lived in a great apartment in the Bronx with her dogs, and cared for her nieces after the death of her sister. Gloria was a hard-working New Yorker, family person, and dog lover. During this time Gloria continued to abuse alcohol to cope with feeling overwhelmed. The death of her sister and the responsibility of raising her nieces, as well as her brother moving in with his family, greatly affected Gloria and drove her to contemplate suicide. With two dogs, her nieces, her brother and his family all living under one roof, and with Gloria being the only one working, they were soon evicted. For the next few months Gloria and her family alternated between living out of her car and couch surfing at friends’ houses. Gloria had to kennel her two beloved dogs after she was evicted. Although she continued to use alcohol as a coping mechanism, she knew she needed help. She wanted to take care of herself both mentally and physically. She saw an Urban Pathways outreach worker one night and reached out. At the time of Gloria’s referral to Urban Pathways, she was in the process of receiving her VA benefits. Urban Pathways had just completed construction of their newest permanent housing residence at Clinton Avenue in the Bronx, which was built to accommodate the growing number of homeless veterans in New York City. Gloria, because of her veteran status, was given priority for permanent housing and she was one of the first clients accepted into the Clinton Avenue Apartments. Today, Gloria is an inspiration to everyone she encounters. She is now the resident adviser at the Clinton Avenue Residences. She is a role model to veterans, especially women who are in the armed forces. Gloria is also the area's veteran advocate and speaks at seminars about her experiences being a female MP in a very traditional country, being mentally and physically abused during her time in the service, alcoholism, and the risks of being homeless. Lastly, Gloria was honored at Urban Pathways Annual Benefit to End Homelessness in 2016. Excerpts of her story are available here.